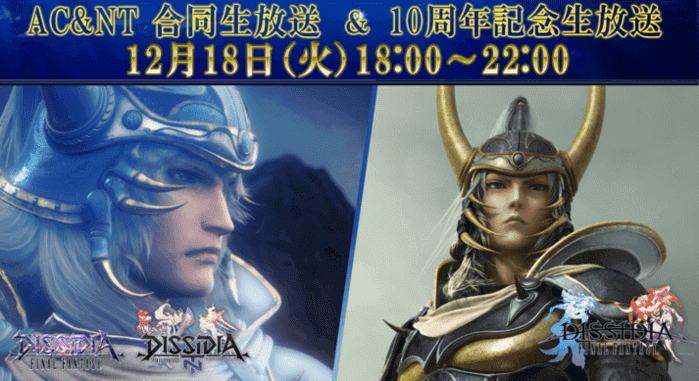 Square Enix is hosting an Official joint live broadcast on December 18 from 18:00 to 22:00 JST for Dissidia Final Fantasy and Dissidia Final Fantasy NT (PS 4 version). The broadcast will be streamed on Youtube. The live stream will convey the latest update information. And also, play and reflection on the memories on the recollections of Dissidia Final Fantasy for PSP and its continuation Dissidia 012 Final Fantasy. Presenter incorporates Ichiro Koa (Square Enix DFF Producer), Takeo Oki (Square Enix DFF Director) and the Guest.